This is Banking a Fifth Third better. That's the idea behind the new advertising campaign from Fifth Third Bancorp (NASDAQ:FITB) launching this week. This is Banking a Fifth Third better. That's the idea behind the new advertising campaign from Fifth Third Bancorp (NASDAQ:FITB) launching this week. The campaign plays on the improper fraction that is the Bank's name. As a fraction, 5/3 translates to more than 100 percent -- 166.7 percent, to be exact -- and going the extra mile to help customers reach their financial goals. "The new campaign leverages our unique name to clearly state that Fifth Third is striving to make banking better by going above and beyond to serve our customers," said Greg Carmichael, president and CEO of Fifth Third. "We want to demonstrate how Fifth Third is addressing the needs of our customers in tangible ways that make their banking experience better - a Fifth Third better. It is more than just a number; it is about what we do every day." The advertising campaign will launch with a series of high-impact TV commercials and digital ads, radio, social, experiential marketing activations across the Bank's 10-state footprint beginning Wednesday, May 3. Taking it a step further, Fifth Third will celebrate babies born on May 3 in the Greater Cincinnati area by gifting them $1,053. Parents will be encouraged to use the gift to start their child's first savings account or a 529 college savings plan account. "Throughout the campaign, we will share solutions and real stories that are meaningful to customers and, when added together, they will show that we are helping to build a better kind of bank," said Matt Jauchius, chief marketing officer for Fifth Third. 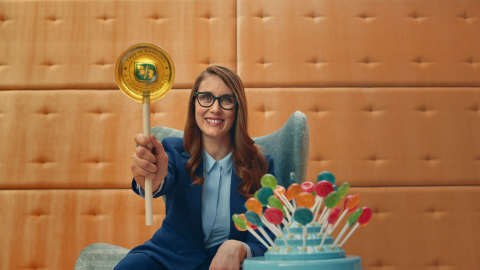 "We are showcasing compelling messages that link to Fifth Third's vision to be the One Bank people most value and trust."